One way to pocket more money when selling your home is to sell it yourself. It isn't a hard process and there are many resources available on the internet to help you from setting your price to finding a buyer. There are many factors to consider before selling your home without a realtor. Realtors provide a valuable service especially for someone who doesn't have a lot of time to deal with it on their own. They also have clients in the market to purchase a home immediately and many times can show and sell your home in a minimum amount of time. They can help determine the best price to list your property and will help you negotiate to get that price. If the Realtor can sell your home quickly, you stop paying taxes, insurance and maintenance on the property. If you do decide to sell your house yourself, your first decision will be how much and where to list your property to find a qualified buyer. If you do a google search on "how to price your property" you will find many sites offering advice. There are also many sites with which to list your property as well for a small fee. Signage and newspaper listings should be considered as well. The next step will be to find a qualified buyer. A qualified buyer will have proof of cash or a pre-approved mortgage letter. It's important to make sure the buyer is qualified or you might waste a lot of time dealing with a person who cannot actually purchase the property. Once you have a qualified buyer and have agreed upon a sales price you will need a purchase agreement outlining the details of the sale. The buyer will give the seller earnest money (as a sign of good faith) upon the signing of the purchase agreement which is to be held in a trust or escrow account. The seller and buyer should discuss the terms of the earnest money and requirements in the purchase agreement so they both understand what would happen to the money if either side has found reasons not to go through with the sale. 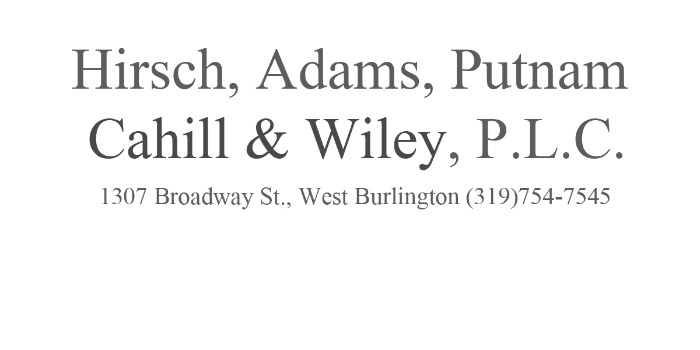 Mr. Wiley and Mr. Cahill can provide valuable legal counsel and are available to write a purchase contract for you, discuss the contingencies to include, and hold the earnest money in their trust account until the closing. After signing the purchase agreement and accepting earnest money both sides will need to complete their duties in a timely manner to ensure you can close by the closing date agreed upon. The seller will need to have the abstract brought up to date by an abstractor and then provide it to the buyer's attorney for a Title Opinion. The buyer will need to have any inspections and appraisals completed as well. There are many ways to split the closing costs. Traditionally, the seller will pay to update the abstract, prepare the deed package, title insurance and bringing the taxes up to date. The buyer traditionally pays for the title opinion, inspections and appraisal. The purchase agreement can be paid for by either or both parties. However, you can agree to split the costs any way you prefer as long as you include the details in your purchase agreement. Call Mr. Cahill or Mr. Wiley today to discuss selling your property (319) 754-7545.